I have been monitoring the growth of the plants within my greenhouse, and I have to say that I am not very happy with the findings. The plants within are growing at a glacial speed, with most showing almost no growth! A couple of the plants have developed nicely, yet the majority are almost dormant. 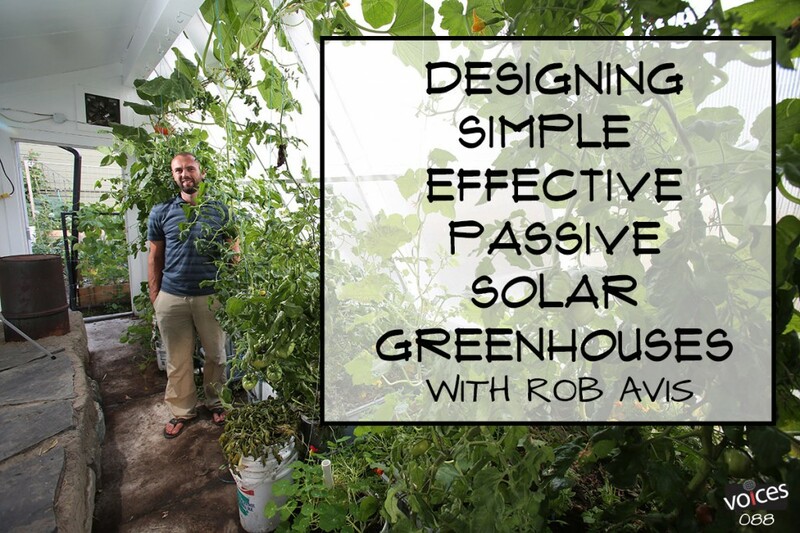 This was initially surprising, as the greenhouse is warm and the sun shines on it with a great amount of regularity. I have been a little baffled as to why the plants are so lacklustre. Could it be that the temperature is too warm? Am I not watering enough? Maybe there was something wrong with the seeds. I have been in ignorance as to the reasons for this, until I was listening to a great episode of the Permaculture Voices Podcast. Diego was discussing Greenhouses and Sun-rooms with Rob Avis, and the topic of the ability of materials to block certain frequencies of light as well as amounts of light, was raised. I began to consider that perhaps the material on the greenhouse was actually preventing enough light from entering. Sure, it was nice and warm in the greenhouse, yet without the right amount of light, it was not doing the job for which it was created. I set up an experiment, I placed one of my mini greenhouses next to the house… and placed a couple of plants (Tomato and Lettuce) inside. Within a couple of days I could see that the lettuce had grown 50%, and the tomatoes were looking much healthier. I have moved a few more plants from the greenhouse into the mini, to see if they too improve. 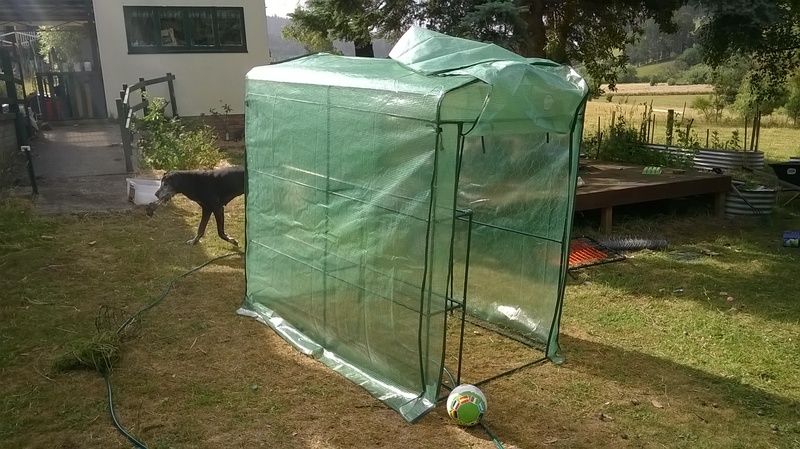 If this experiment shows that the greenhouse is not working as it should, I don’t know what I will do… apart from moving all the plants within it to mini greenhouses. On a positive note, I have harvested my first Hazelnut from my Hazelnut trees. 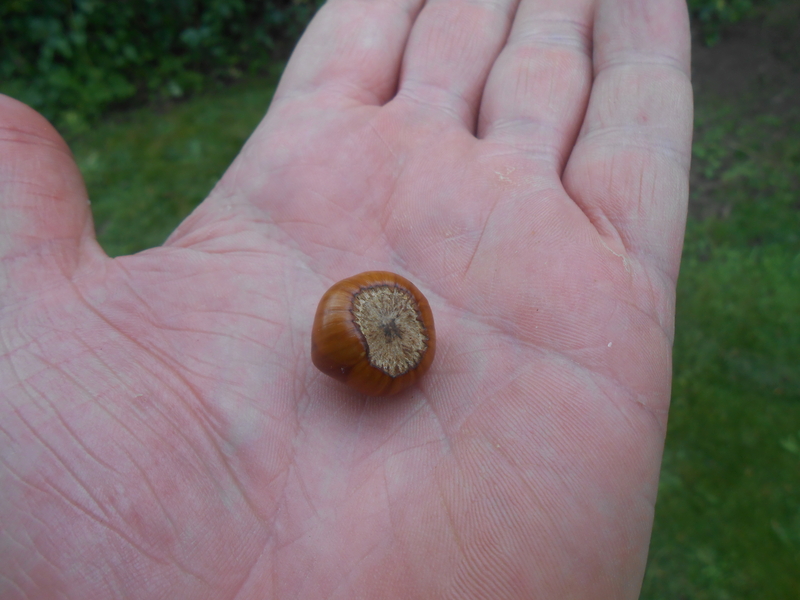 These trees are only about 1.5 meters tall, and I planted them around 6 months ago, yet I have harvested the first (and only) hazelnut from the tree! I was so happy to have found it, I have been showing everyone who is interested… and even friends who are not interested. It was only a chance discovery… I didn’t expect to get anything from them, I was just adding some mulch to the bases of the trees, to ensure that they would be happy over winter, when I stopped to examine the tree. I have been training the tree to grow in a certain way, as I want the branches to be in a particular shape. It was then that I noticed the nut, still hanging onto the tree. Not the biggest hazelnut, but I am very happy with it. I will have to decide whether I eat it, or plant it.